Cornish WebServices successfully provide website translation and ongoing search engine Optimisation in several languages using a mixture of professional translators and staff who are fluent in a variety of languages. We have two fluent French speakers on the payroll, one of whom has worked for many years in International SEO and PPC marketing. What is the best local domain? This is not always the same as the UK one with the country specific domain ending. Where is it best to host the website? Usually in the local country. But not always. There are many exceptions where a 3rd country for hosting is more advantageous. Launch strategy. Simply `placing' the non-English version of the website live on the Internet will give a slow increase in natural rankings and increase the time period take to gain high natural rankings. WHen launching any new website Cornish WebServices always to optimise the manner in which the website is shown to the search engines. 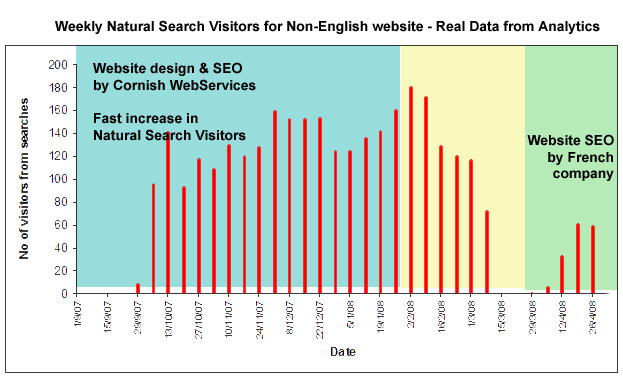 The figure below shows how a French website developed by Cornish WebServices performed very well, gaining a large number natural search visitors very quickly. After four the months the client changed website management policy, deciding to use locally based website providers. . When the same website was re launched using a company in France, numbers of natural search visitors started to rise much more slowly, as no launch strategy was used. Results in subsequent months were no better, with total leads in a year being less than previously in a year. When placing new websites live on the Internet, following a search engine optimised launch strategy produces many more natural search visitors in the first few months and gives the search engine Optimisation process a head start. Cornish WebServices implement a se optimised launch strategy on almost all websites, but especially when launching non-English versions of a website for International marketing. Cornish WebServices have provided websites in English, French, Dutch, German, Russian, Spanish and Arabic and can offer ongoing search engine Optimisation and PPC management services in many of these languages.